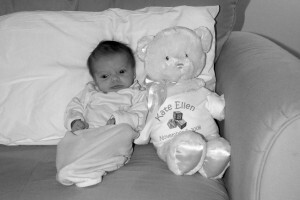 « Kate Turned Three Weeks Old…and We Missed it! Kate is a great teacher…. No matter how many times people tell you that fatherhood will change your life, there really is no way to really understand how awesome a change it is until you experience it. Now that I have had the pleasure of caring for Kate for a little more than three weeks, I am quite sure that Kate is teaching me about life everyday. If you have had the fortune (of misfortune) of actually interacting with me, you may have noticed that I generally think that I have everything figured out. I try hard not to act as though I know everything, but sometimes it is quite obvious that I think my poop is not stinky like everyone else’s. Kate, of course, does not care if I know everything – she really only wants me to understand what she wants and immediately react. This is a very humbling experience for me … every minute I am with Kate. For example – Kate is hungry pretty much all the time if she is awake (she really prefers to sleep more than she likes to eat which is why we wake her up when it is time to eat). 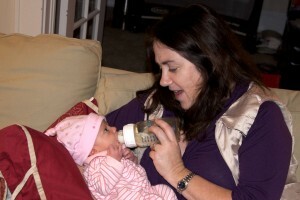 For me, eating is a straightforward experience – either find Jennifer (Kate’s main source of nourishment), find fresh breast milk in the fridge, or mix some formula. As far as I am concerned, Kate says she is hungry, so she should drink all that is in the bottle as quickly as possible and go to sleep. Dad gets frustrated when Kate takes her time drinking, doesn’t want to burp when daddy is bouncing up and down with her on his shoulder, and then decides she wants to take a nap before drinking the rest of the bottle. Dad needs to learn to slow down! Aunt Kathy showing Mom and Dad how it is done! My sister Kathy visited this weekend. Either Kate was happy to see someone else in the house other than the two amateurs who have been caring for her, or Kathy has “the touch” (my vote). Kathy was much more patient with Kate than I have ever been (and I thought I was the king of patience!). Kate’s reaction was the proof I needed to realize that Kate has been trying to tell me to relax and take my time – there is no rush! It happens time and time again – Dad wants Kate to go to sleep so he can finish uploading the 800 pictures he took during the day, but Kate wants Dad to hold her and sing to her for 45 minutes so she can relax and feel safe. Slow down Dad…relax and enjoy spending time with Kate! So…Kate has taught me to take life slow and relax…she reminds me every day! This entry was written by John, posted on November 30, 2008 at 10:13 pm, and filed under Uncategorized. Kate looks more beautiful and more attentive every day. We miss her greatly. The life’s lessons are just beginning for the parents–as much as you may teach her, she will teach you. Keep the smiles coming, Kate.